Funerals in Semlak are described by Katharina and George Kaiser in a HOG Heimatbrief (newsletter) and I have attempted to translate those parts which I thought would be of most interest.. The elderly and the sick were cared for in their homes or in the homes of their children. There were no hospitals or hospices. As death neared, the minister was called to give communion. A medical officer would be called to certify the death. It was a rule or law (not sure which) that the dead had to be buried within 48 hours—I’m sure this is because embalming was not practiced. The relatives would be immediately informed and they would arrive at the house to help in the preparations of the wake and the funeral. The women would begin baking and the men would go about getting the liquor. A coffin would be bought and the grave was dug by the Glöckners (the bell-ringers) who would be compensated for their labor. The coffin was placed on a platform very much like two sawhorses. In the winter the body would be in the gutestube (good room) in the house and in warmer weather, it would be placed outdoors. There was a fellow by the name of Andor Toth in Semlak who was a master carpenter and he was also the coffin maker. The coffins were painted and the name of the deceased, date of birth, and age at death would be inscribed on a bronze or silver plaque on the cover. The coffin was lined with a dead cloth that was purchased from women in the community who were recognized for this specialty. There was also a pillow that was embroidered. The corpse was washed and, if the dead were a male, was shaved. Clothes were carefully selected —for the males it would be the most beautiful suit, the newest white shirt, and new socks; for the females the most beautiful skirt, blouse, apron and head clothe was picked. They even made decisions as to how many underskirts the deceased would wear. Sometimes the relatives did the task of preparing the corpse and other times, women were hired to prepare the body. Their payment would be in the form of gifts such as dresses, soap, or flour. The next task in funeral preparation was to empty the largest room of all furniture. Chairs were then set up for the family and relatives of the deceased. All mirrors in the house were covered with black, embroidered woolen cloth. A funeral might be the first time the good room was used. Since many families consisted of members of both of the German communities’ churches, bells were rung at both the Evangelische (Lutheran) and the Reformierte (Calvinist) churches. In fact, often the bells would be ringing at all five of the Semlak churches—this would happen when the deceased was either young or widely known in the community. The first ringing would be by the home church of the deceased and shortly thereafter the other bells would begin to toll. There was a pattern for the tolling of the death bells. If the deceased was a man, the large bell would begin the ringing, tolling twice. Then the small bell would be tolled as well. For the death of a woman, the small bell would first be tolled twice, followed by the joint ringing of both bells. If the death was of a child, the small bell was rung once and then the two bells were rung together. During the day, there are what we might term calling hours. Then at night, there is a gathering of the community. The family would be in the good room with the deceased and in the other rooms tables were set up to accommodate the community members who gather to sing the songs of the dead from the hymn book. I can remember that these practices were honored at the death of my grandmother in America—I believe it was for the sake of my grandfather who still followed most of the Semlak traditions. Grandma’s relatives and Semlak friends arrived with their hymnals. Grandma was laid out in the front living room; the mourners, mostly women, seated themselves in the dining room and began singing the traditional death songs. The men were in the kitchen sipping schnapps. In Semlak, the minister arrives to give his condolences to the family, says some prayers, and then he goes and sits with the singing community. After the singing, the body is covered with the dead cloth and the liquor bottles are then passed around among the men and the women eat kuchen and drink coffee. They talk about God, the world, and the deceased. This activity continues until midnight and is called the dead guard. On the day of burial, the bells ring at 11:00 in the morning and at 2:00 in the afternoon. Most of the funerals take place at 2:00 in the afternoon. The bells intermittently ring for an hour and then 15 minutes before the “funeral,” they ring continually signaling to those who wish to participate to gather at the dead one’s house. In the yard of the deceased’s home, benches (provided by the town) would be set up and a table with an embroidered (black or white) cloth for the minister. A funeral service in the church was only for those who had been church dignitaries. Eventually pictures of the dead person would be taken. This is still practiced for upon our visit to Semlak, my cousin, Bartolf (Langosch) Susi, showed us pictures of her two sisters in their caskets in 2002. After the bells had stopped tolling, the service would begin. The coffin cover would be put in place by two of the pallbearers. Nails had already been put in the place and they would be hit to nail the coffin shut. The service was begun with the singing of hymns. While the service was going on, some of the pallbearers would have the task of carrying the wreaths and flowers into the yard. They would open the mourning room windows and turn the chairs on end (a superstition that they believed prevented another death happening too soon in that house). There was a set or fixed order for the seating at the service. At the head of the casket, the remaining spouse and children would be placed; at the foot would be the deceased’s brothers and sisters. Behind them would be the nieces, nephews, cousins, etc. depending upon the degree of relationship. The wreath of the spouse was placed on the coffin cover and the other wreaths would be hung on the yard fence or on the vines. The service consisted of the singing of hymns, Bible readings, the personal record of the deceased was presented, the sermon, and then the minister, in the name of the corpse, said goodbye to the marriage partner, the children, parents, brothers and sisters, neighbors, etc., etc. He had to be very careful not to leave anyone out as these would all be people the deceased had greeted daily. As the last mourning song is sung, the procession to the cemetery is formed. Those in the lead are the cross bearers who are two elementary school children. They like to be cross bearers because, if they do their job well, they are given some money at the gravesite. The bearers of the cross carry the wood piece, which has the dates of birth, and death engraved on it and is used to mark the grave. For the Evangelische, it is a triangular shaped board and for the Reformed, it is an Acacia wood stake. Following the cross bearers are the minister, the church father (not sure what his role is), and the curator who leads the singing on the road to the cemetery. If a band accompanies the procession, the singing and the band play alternately. In Semlak, it was the practice for the coffin to be carried on the shoulders of eight men. To be asked to carry a coffin was considered an honor and a holy obligation. However, if the deceased’s house was at one or the other end of the village from the cemetery, then twelve men were chosen as pallbearers. 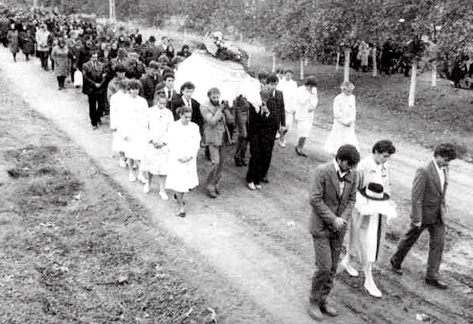 They would share the task of carrying the coffin the two kilometers from the house to the cemetery. The coffin is preceded by the mourning guests and is followed by the pallbearers’ wives who carry the wreaths. While the procession is going to the cemetery, the church bells are tolling. At the grave, the minister leads the mourners in reciting the Apostle’s Creed and the Lord’s Prayer. The wreath of the closest relative (the spouse most often) is placed in the grave with the coffin and then the pallbearers close the grave with shovels and their heels. They place the grave cross in the fresh earth and finally the wreaths are placed upon the mound. A final funeral farewell hymn is sung as the minister leaves the grave and then the community takes its departure as well. They return to the home of the deceased and cake is eaten, liquor is drunk, the chairs are returned to the community building and the funeral is over. In earlier times, there was a special meal cooked for the relatives and the pallbearers, which usually consisted of sheep paprikasch. One family story concerned my grandmother’s activity at a funeral in Semlak. She was one of the women who were to remain at the deceased’s house when the procession left for the cemetery. Their task was to clean up the dwelling and to change the linens on the bed. As she prepared to strip the bed, she felt the sheets and they were warm! The person wasn’t dead after all. She ran from the house to the cemetery to tell them not to bury the person. I don’t know what the illness was, but the person was either in a very deep, sick sleep or in a coma. It is easy to see how this might happen, as they didn’t embalm their bodies. Since there were no fir trees or florist shops, wreaths and flowers were usually made of paper in Semlak. There were several women in the community who made them. Deceased girls were usually dressed as brides. The young woman’s best friend, or a relative, would precede the coffin carrying a bridal crown on a pillow. Her young female friends wore white dresses at such a funeral. Suicides, in the past, were buried at the edge or in the back of the cemetery. No bells were not allowed to be rung. However, today this is not the practice and suicides are given the same treatment as other funerals and burials. In the picture above, it is assumed that a young man has died since the two lead mourners are carrying a man’s festival hat. © 2006-2013 Rose Mary Keller Hughes unless otherwise noted.